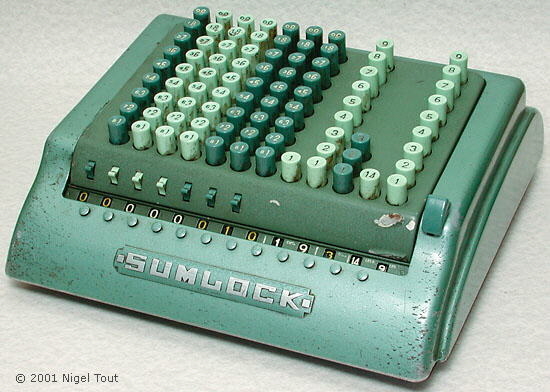 SUMLOCK model 912/Y Imperial-Weight "Comptometer"
This is a direct action keyboard calculator of the "comptometer" type with a keyboard for calculations in Imperial weight units. The machine illustrated has serial number 912/Y/122703. One Stone = 14 Pounds (lbs). 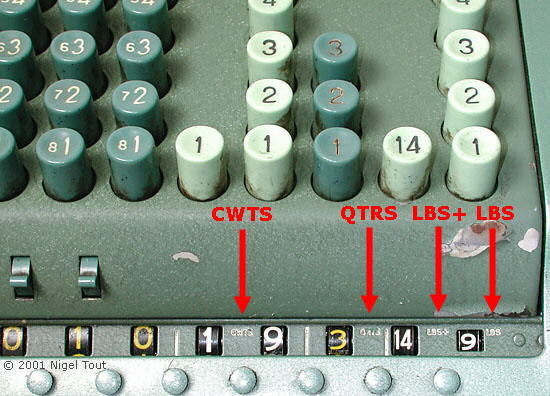 The keyboard of this machine (see below) has keys with, from the left, 7 columns of Tons keys, 2 columns for Hundred-weight keys, 1 column of Quarters keys, and 2 columns for the Pounds keys. Yes, the single key in the second column from the right has "14" on it, which is the number of Pounds in one Stone. The value in this column has to be mentally added to the number in the right-most column. There is carry over when this sum reaches 28 into the third column from the right (ie. Quarters). The machine in the photograph displays the total of 10 Tons, 19 Hundred-weights, 3 Quarters, and 23 Pounds. 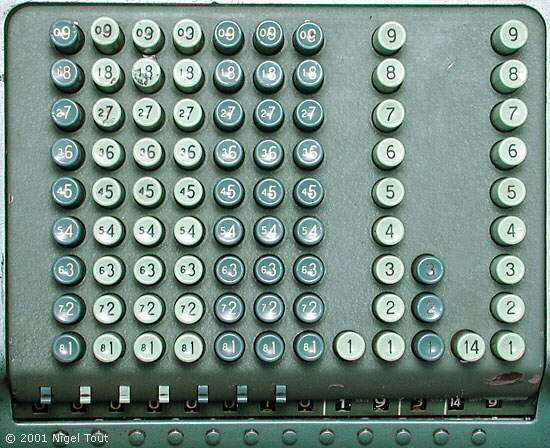 The strange keyboard of this Imperial weight calculation machine.